Have you had a plant caddy before that rotted or rusted or you spent hours trying to assemble? Has the caddy broken or come apart after just the first few uses? Whether you're a professional landscaper, garden enthusiast, or homeowner we know you want and deserve the best. You Want: A sturdy, anti-slip, fully assembled plant caddy with brakes that can be used indoor or outdoor. 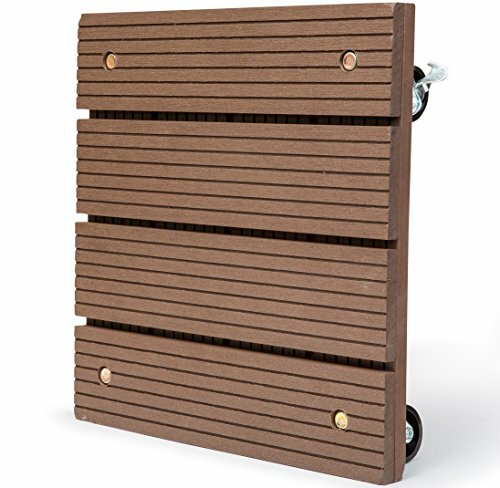 You Need: A heavy duty, wood plastic composite plant caddy with 4 metal ball bearing wheel casters, 2 wheel brakes, and a grooved surface. You Desire: The beauty of wood, but the durability and long life of plastic, cast iron, or brass. You Get: Everything you want, need, and desire with the Big Blue Gardens Plant Caddy. Material selection and design are a big factor in performance: The composite resin platform provides the beauty of wood and the durability of plastic, complimenting any indoor décor or resisting the weather outdoors. Easy turn and locking wheels: The caddie is easy to use. The ball bearing wheels rotate 360 degrees with ease. The square design means all wheels will pivot in the same direction and the brakes prevent accidental rolling. Versatile Uses: The caddy is also handy with personal items. Its 3 inch height means it can guard belongings against spilled liquids in the garage, workshop, or basement, or carry kitchen mixers or aquariums. 100% Satisfaction Guarantee! Our plant caddy is backed by a manufacturer 30 day money back guarantee with 1 year free replacement warranty. You can buy with confidence from Big Blue Gardens. Don’t Delay, Buy Today: Click on the Add to Cart button now and get your Big Blue Gardens Plant Caddy on its way to you. SATISFACTION GUARANTEE: Our composite resin (recycled wood and plastic) plant caddy is backed by our manufacturer 30 day money back guarantee with 1 year free replacement warranty. We wish a special "Thank You!" to all our repeat customers that are buying the Big Blue Gardens Caddy 2 and 3 or more at a time and not just for potted plants anymore! Many are using the dolly to hold heavy printers, kitchen mixers, mixing bowls, salt lamps, and crystals; Product packaging subject to change. If you have any questions about this product by Big Blue Gardens, contact us by completing and submitting the form below. If you are looking for a specif part number, please include it with your message.